Knights to host six games at Spectrum Stadium. After starting last year on the road, the Knights will open up 2019 at the comforts of home, hosting Florida A&M on either Thursday, Aug. 29, or Saturday, Aug. 31 (television TBD). It will mark the fourth time in the last five seasons that UCF has opened up at Spectrum Stadium. UCF will travel to its first road game on Saturday, Sept. 7 at Florida Atlantic. At 2-0 all-time against the Owls after winning 56-36 in 2018, it will mark the Knights’ first game against FAU in Boca Raton. UCF will close out non-conference action on Saturday, Sept. 21, as the Knights will head up to Pittsburgh to take on the Panthers. Last season, UCF delivered a 45-14 win over over Pitt, who went on to clinch a berth to the ACC Championship game. The Knights begin their quest for a third straight conference championship when they open up play in The American on Saturday, Sept. 28, against UConn on Family Weekend. UCF then hits the road to challenge Cincinnati on Friday, Oct. 4. The Bearcats finished 23rd in the Amway Coaches Poll in 2018. Following a bye week, the Knights will host ECU on Saturday, Oct. 19 for Homecoming before they travel to Philadelphia on Saturday, Oct. 26, to take on Temple. 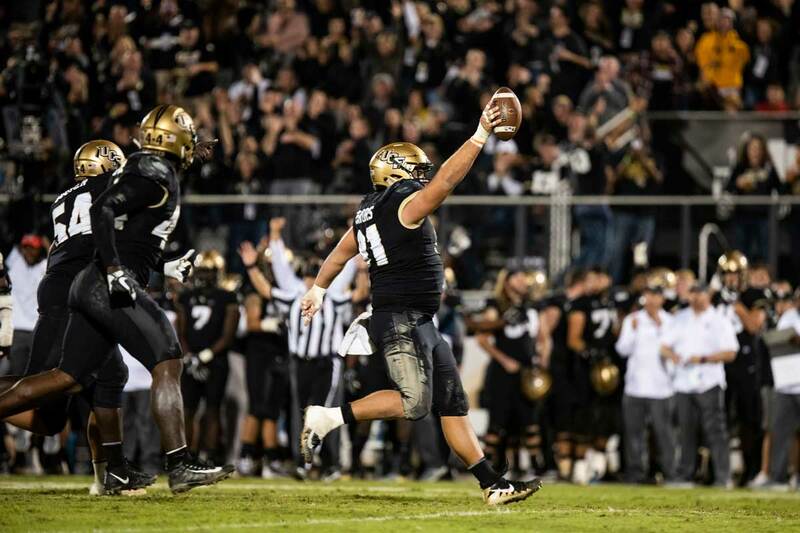 UCF will then face three opponents out of The American’s West Division that the Knights haven’t seen since 2016. They’ll host Houston on Saturday, Nov. 2, for the UCF in Space Game, before traveling to Tulsa for a game on Friday, Nov. 8. Following a bye, UCF will play at Tulane on Saturday, Nov. 23. The annual War On I-4, which the Knights have won each of the last two, will once again take place on Black Friday. UCF and South Florida will square off on Friday, Nov. 29, at Spectrum Stadium. You can catch the football team before next season at the 2019 UCF Spring Football Game presented by DEX Imaging. The April 13 game slated is start at 2:30 p.m. at Spectrum Stadium.